There he was – almost out of his element. Daniel Hogue road along the Forest Service road in his BMW sidecar in the dead of winter with several other hearty souls along roads few ever travel after the first rains of the season fall. Indeed Daniel and I had covered this same stretch of road earlier this past summer during the Sasquatch dualsport poker run. I recall inviting him to come and assist with checkpoint number one on the route. He lived nearby the checkpoint and it seemed a good excuse to get him out of the house for the day and doing what he loved to do the most –ride his motorcycle. After the checkpoint closed he joined us for lunch south on Highway 101 and I figured that would be it for him that day. I always appreciate when Daniel helps out on events and if I can pick up his lunch tab all the better. But I was surprised to his answer of ‘yes,’ when over a burger and fries he agreed to join me on the third leg of the poker run between Dosewallips and Hama Hama. Daniel is an above average rider, like few I’ve ever known. His age has essentially nothing to do with his riding skills. It really matters not how old or young you are, riding skills are developed and maintained based on how many miles you ride each year and how you think about each mile as you ride it. You could be twenty or sixty, but if you ride each mile with perfection you can’t help but retain or improve your skills. A lesson few ever learn. I remember how both Daniel and I maneuvered that stretch of road. I had only ridden it once and Daniel mentioned that he ‘…may’ have ridden it some years ago. Perhaps… One thing was for sure - few ever ride this stretch of gravel road. Fast forward to Snow Camp of January 2007. Daniel had the idea that he would go join the hearty souls at Snow Camp in Brinnon just south of Quilcene along the Hood Canal over Martin Luther King Jr. Day weekend in January. I would have too had it not been for that sixty foot sheet of ice that lay between my driveway and the main road. It was our third snow of the season and after a week of freezing temperatures I was basically restricted to four wheels at my home in Seattle. Off Daniel rode on his three wheeler to Brinnon to join the troops at Paradise Cove. Would there be snow? Indeed, right at sea level and more where that came from in the Olympic National Forest above to the west. Evenings at Snow Camp consist of eating, a fire, liquid sedation and more eating as a means to keep warm. After all, at thirty degrees the best way to keep a body warm is with food, of course. 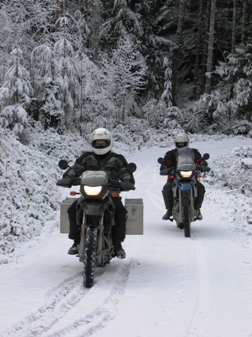 On Saturday, Daniel took off with a few others in search of a snow-covered road. The road chosen was nothing new to Daniel. It was the same road he and I had ridden that previous summer, only this time it had several inches of snow. A sidecar rig in the snow is no big deal. Three wheels is the best offense to an unpredictable terrain. One wheel slides – the other two correct. As for the two wheelers in front and behind Daniel – now that’s a different story. The trick is not to crash and injure the rider behind you. The boys passed the gully where Daniel and I had left our mark last summer. As they reached the Y in the road a stop was called. The photographs are vague at best… You’ll have to arrive at your own conclusions, but here’s what we know. 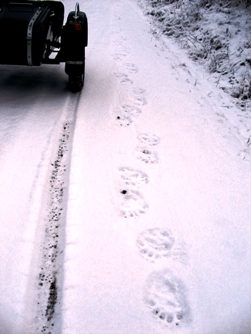 The photographs reveal some sort of paw prints in the snow next to Daniel’s tire tracks from the sidecar. Upon closer examination we blew the photographs up and took them to a specialist at the Carkeek Animal Hospital. "Too small for a canine" said Dr. Zawarski …"and there’s no nails to indicate it was a bear," said Dr. Sazarki. In January, on the third snow, it’s not likely you’re going to see a bear. Any sane bear (one that’s not running around on a 50/50 prescription of Xanix and Vicadin) is sleeping as any bear should be in the dead of winter. After a check with both the Mason and Jefferson county Animal Control units none had any record of any strange large-pawed species domesticated in either county. Was it the familiar odor from the past summer’s urination… or just a fluke incident? Whatever it was, did it smell Daniel on approach and then attack? Was it male or female? Two things are for certain. Whatever it was, it didn’t have the sense to pick Daniel's camera up off the ground and…and …this time Daniel never did make that right turn at the Y in the road. Click here for to see all the photos.